transcosmos inc. (Headquarters: Tokyo, Japan; President and COO: Masataka Okuda) is delighted to announce that the company has developed next-gen contact center services powered by “Amazon Connect,” a cloud-based contact center service by Amazon Web Services Japan (AWS). The services, integrated with speech recognition system IVR, intelligent conversational bots, and other AWS AI-powered services, are launched on December 12, 2018. transcosmos aims to implement the services to 100 companies by the end of FY2020. 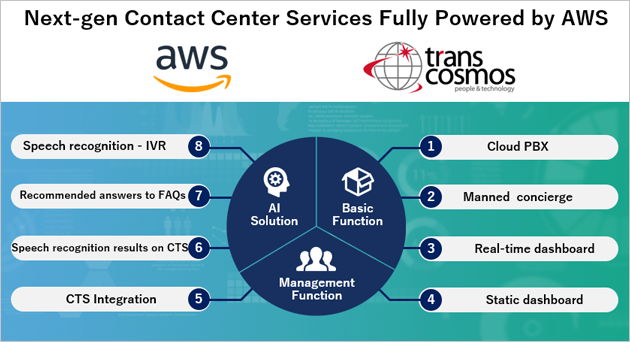 The next-gen contact center services that merge transcosmos’s operations know-how into the basic functions of Amazon Connect enable clients to offer comprehensive contact center services that range from a cloud-based flexible system architecture to operations consulting services. 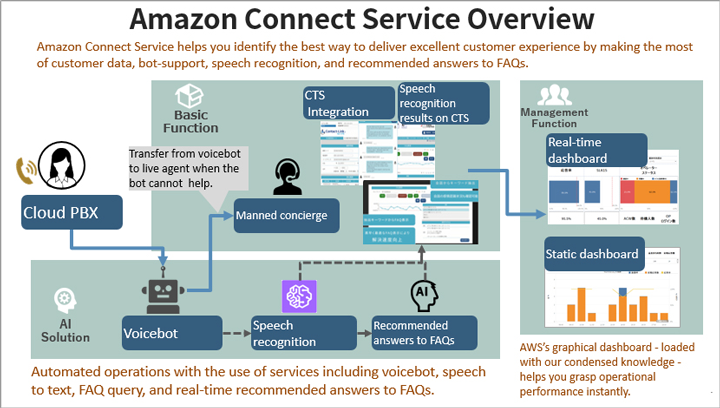 The key features of the service cooperating with Amazon Connect include its ability to smoothly integrate systems that ensure a seamless handoff from an AI-based conversational bot to a manned concierge by capturing the entire conversation between the bot and a customer, and pass it to the concierge. In addition, with its AI-powered features such as providing recommended answers to FAQs, clients can boost the level of customer service quality. The service also provides a BI dashboard as its standard feature with real-time and historical metrics. With the dashboard, clients can check response rate and other performance metrics in real-time, whilst managing operational quality on a weekly to monthly basis based on the historic metrics. (*Clients have access to all services in the English version). As a leading outsourcing company, transcosmos will create an additional value beyond the system by providing services that meet the needs of each individual client. Amazon Connect is a cloud-based service that makes it easy for any business to open a scalable call center at a lower cost. With its graphical interface, clients can intuitively design and manage contact flows and routing. What’s more, because there is no required infrastructure to deploy or manage, clients can easily scale their Amazon Connect contact centers up and down, onboarding agents in line with their business demands. Now, as AWS opened up an Amazon Connect in Tokyo, Japanese clients can select the Asia Pacific (Tokyo) for their Amazon Connect and create an instance of Amazon Connect in Japan, no need to access other Amazon Connect anymore. transcosmos has already built Proof of Concept (PoC) models in other Amazon Connect. With the aim to deliver the best solution that meets the needs of each client, transcosmos plans to integrate its proprietary services with other cloud services in addition to AWS. *Amazon Web Services, AWS and Amazon Connect are trademarks of Amazon.com, Inc. or its affiliates in the United States and/or other countries.